This small, volcanic island forms part of the Leeward Caribbean Islands, located at 14ᵒ1’N, 60ᵒ59’W. It is also known as the Helen of the West Indies, being likened to the irresistible Helen of Troy! Indeed who can deny the drama of its 238 mi²/381 km², majestic volcanic scenery, the highest point being Mt. Gymie (3,120ft/950m), climaxed only by the unique Pitons (2,000ft/610m), rising like two giant sentinels from the sea (wonderful snorkelling). Fun things to do in Saint Lucia: visit lush rain forests, natural harbours, white sand beaches, unique drive-in volcano (take your nose plugs – it’s a little sulphuric! ), hot springs, and cassava bread (on the way to Soufriere). Local arts and crafts in Castries. Historic points – Pigeon Island, or better still, go there during the Jazz Festival. View our full list for Top Things to do in Saint Lucia. 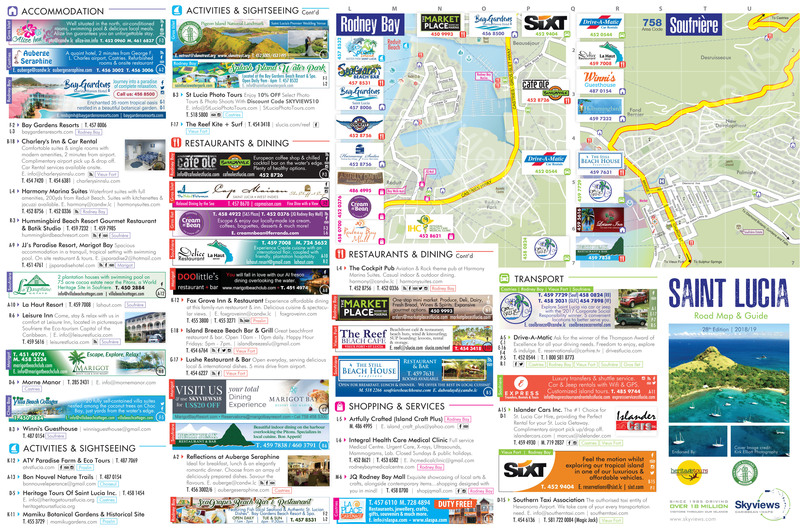 View the electronic version of our 2018 Skyviews Saint Lucia print map. Visiting Saint Lucia and wondering where to stay, what to do, where to eat and how to get around? We’ve got you covered with our list of hotels, restaurants, activities, car hire, shopping & more. Browse through for more details. Heritage Tours Of Saint Lucia Inc.
Public Holiday In 2018 St. Lucia will celebrate its 39th Independence Anniversary. A return to the original vision of a celebration of Saint Lucian, Caribbean and international jazz music, with events in all parts of the country - a mix of free and paying concerts, educational activities targeted at Saint Lucian and visiting musicians, culminating on Mothers’ Day, May 14, 2017, in a major concert at the Pigeon Island National Landmark. Saint Lucia celebrates Chocolate Heritage Month recognizing the role that cocoa and its beloved by-product, chocolate have played in the history of the island. A festival dedicated to musicians who are setting new trends in reggae, conscious hip-hop, Afropunk and R&B, with performances, master classes and encounters between artists and other actors in the music business. A small but growing 2-day event held in Rodney Bay each year. Regatta Classes include a Cruising Class, and a number of Racing Classes including J24 and Surprise. 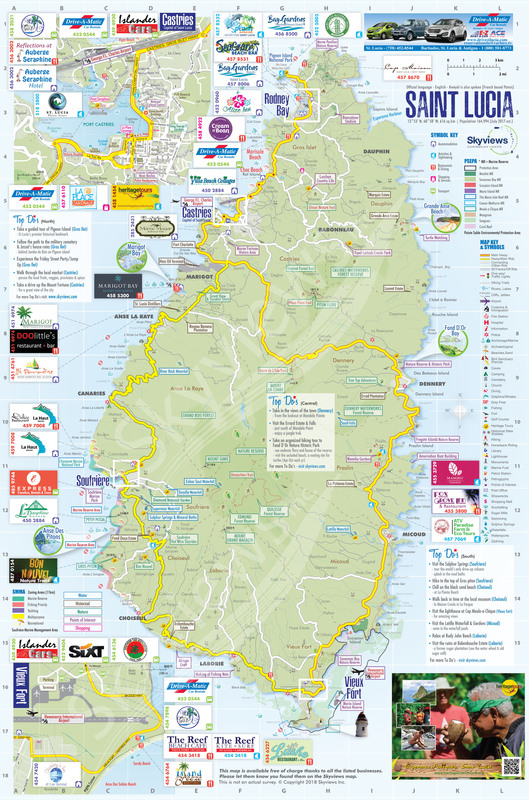 This triathlon hosted in Saint Lucia sees a week of fun sporting activities including an ocean Swim, an aquathlon (swim and run) and a beach run. The St. Lucia Game Fishing Association in collaboration with the IGY Rodney Bay Marina hosts its annual St. Lucia International Bill Fish Tournament at IGY Rodney Bay Marina. Public Holiday The Festival of Light is celebrated on National Day, December 13th, the Feast of Saint Luce, Patron Saint of Light. Like many islands in the Caribbean, Saint Lucia was inhabited long before the Europeans arrived. Arawak Indians had settled in Saint Lucia around 2,000 years ago. They called the island ‘Iouanalao’, Land of the Iguanas. The second wave of settlers consisted of the warlike Carib Indians who had more or less removed the Arawaks by 800AD. They called the island ‘Hewanarau’ and, in fact, Saint Lucia was christened with its saintly name only in the late 1500’s. There is some speculation as to which European set foot on Saint Lucia first. Columbus in 1502 on his 4th voyage to the West Indies or, more likely, the Spaniard Juan de la Cosa, a lesser known but no less prolific explorer, who had sailed alongside Columbus on two previous voyages. The first European settler was Francois Le Clerc, a French pirate known as Jambe de Bois (peg-leg) who set himself up in Pigeon Island with 330 men and waylaid any passing ship. The Dutch got going at Vieux Fort in around 1600; and the English arrived accidentally in 1605 when their ship, The Olive Branch, was blown off course whilst attempting to reach Guyana. This resulted in 67 Brits stepping ashore. They were gradually whittled down to 19 in one month by the resident Caribs. The remaining settlers decided at that point not to push their luck any further, and fled in a canoe. The French West India Company’s representatives bought the island in 1651 but eight years later the English disputed the sale (on principle, one suspects), and this ignited hostilities between the two nations for the next 150 years. During this period, the island officially changed hands no less than 14 times until 1814, when it was ceded to the British. The French and English place names are a legacy of this struggle. Saint Lucia’s sugar cane industry prospered with cheap imported slave and indentured labour from Africa and India but with the abolition of slavery in 1838, it declined and had totally disappeared by the 1960’s. Thus today’s Lucians are of mixed African, European and, to a lesser extent, Amerindian origin, and you will find this delightfully apparent in the faces you see. Local culture is reflected in the vibrant French Caribbean rhythms of Zouk and Cadence (pronounced ‘k’dance’), the widely spoken Patois language and the distinctive Creole cuisine – inventive, spicy and always colourful. As with many of the British territories after World War II, Saint Lucia sought total independence. The right to vote was introduced in 1951 and, after unsuccessful attempts to gain increasing autonomy through the ill-fated West Indian Federation of 1958, Saint Lucia enacted a new constitution. When it expired in 1967, full self-government was granted by the British with Saint Lucia becoming fully independent on February 22, 1979. It remains a member of the British Commonwealth. Saint Lucia’s tourist industry has grown steadily in the last 20 years. Its increasing appeal as an eco-destination because of its delightfully unspoilt natural resources, augurs well for the future. Lucians have a reputation in the rest of the Caribbean for being surprisingly worldly, mentally tough and resourceful. Despite the many perplexing developmental issues for the Small Island Developing States (SIDS) across the Caribbean, there is no doubt in anyone’s mind as to Saint Lucia’s potential – one feels that the St. Lucian people are just the sort to realise it. Beautifully.